Socialize, makers of a “Social SDK” for mobile developers, is today launching version 1.0 of its “Social Action Bar.” This action bar is an easy-to-install mobile toolbar of sorts, which allows an app’s users to view the popularity of the app’s content, “like” and comment on items, and share content via SMS, email, Facebook or Twitter. In addition to the Social Action Bar SDK v. 1.0, the company is also offering an API for HTML5 developers with similar functionality. Socialize grew out of the app-making service AppMakr, which had previously built apps for brands like Disney, The Washington Post, Newsweek and Politico. In 2010, the company raised $1 million from Lotus founder Mitch Kapor, Bill Lee, Rich Chen, Charles River Ventures, and others. Shortly after, the company rebranded as “Socialize,” with the intent to provide mobile app developers with a customizable software development kit (SDK) that lets them quickly add social features to their apps. Says CEO Daniel R. Odio, the SDK can be installed in 5 minutes or less. The Socialize open source SDK, which launched earlier this summer, allows for the above-mentioned social activity (likes, comments, and shares), plus an “activity pane” allowing users to see what others have liked, commented on and shared, too. The idea is to add a social layer to all apps, allowing an app’s users to socialize with each other as well as with the brand itself. AppMakr is currently serving as the testing grounds for the Socialize beta, and the growth there has been massive. The beta channel is up 1 million end users from 30 days ago, with 3,768,381 users now testing the service. Meanwhile, the externally-implemented SDK is smaller, but also doing well, with 95,743 end users, up grom 45,000 just 30 days ago. Now the Socialize Action Bar SDK has reached version 1.0, which means it’s stable and ready for more broader testing. 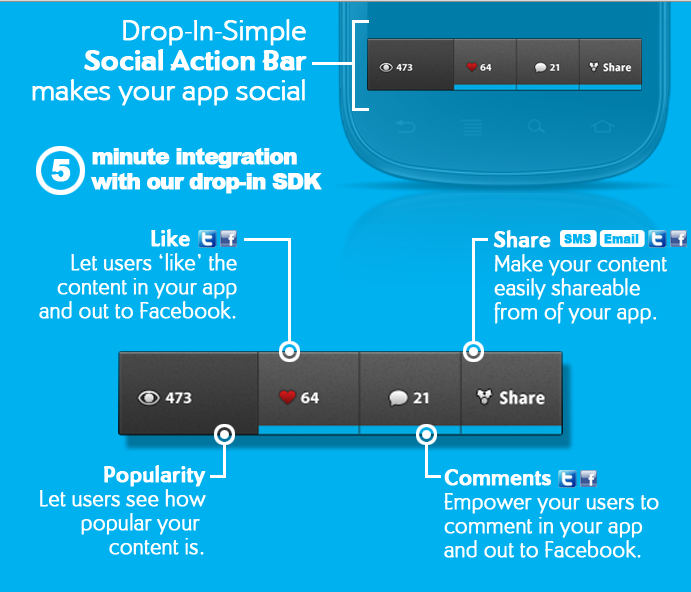 Developers interested in making their apps social can grab the new SDK from Socialize’s website here.